This also gained color swatches for the color prefs on the settings screen, which I think is a pretty substantial useability win. - New Feature: Randomize enemy formation! The big reason for this update is to fix a crash that happens on startup occasionally. We, uh, forgot to call the super class in one of our initialization procedures. Not clever, but it happens. But, if you're doing an update always try to include some other things... so that we have. You can now have the enemy ships randomize their formation periodically, instead of just sticking with a single one. You can also now adjust the hero ship's position relative to the bottom of the screen -- if you ended up with the ship mostly behind your phone UI it's easy to fix that now. Another minor adjustment should give generally better enemy behavior in landscape mode, so tablet folks in particular should be better served by this update. This is mostly a bug-fix update, as while testing things on Android 4.0 I found an issue with the fish picker's layout. The last column went missing, and as it turns out simplifying the layout a bit solved the issue. I also switched out a couple icons so things work better if the background color changes. - New Feature: "Intense" theme! This is ready to go and will likely be uploaded in the afternoon sometime. Basically, what we have here is a new, very dense theme courtesy of excellent artist Kim Lathrop. It's been added to the list under the name "Intense." The other themes have gotten some tweaking as well, and should have some more visible complexity and depth. Hopefully everyone digs the update! 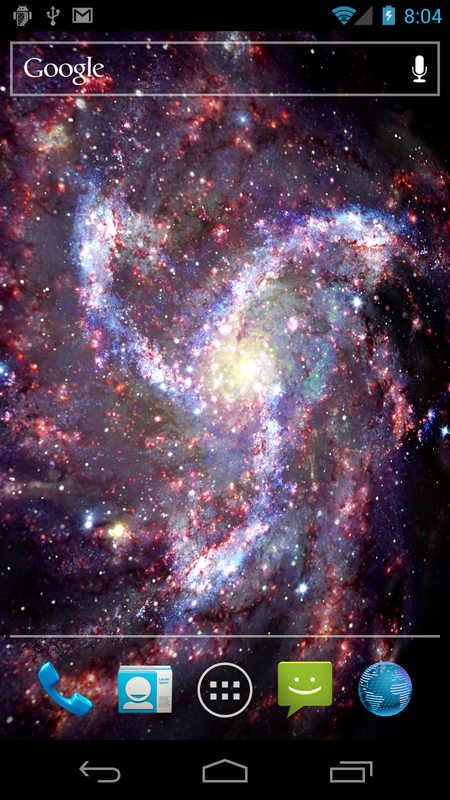 - New Feature: Giant Super Laser! - New Feature: Homing shots weapon! - New Feature: Randomize Weapon! A bunch of new features here, in particular you can tap on the hero ship and fire a super laser! It decimates anything it touches! We also added a new home weapon type, and the ability to randomize the hero ship's current weapon -- it'll pick a new one every ten seconds or so. One of our art folks (Allyson Vaughn!) has been working on this in the background for a while now, and the end result has turned out really nice. 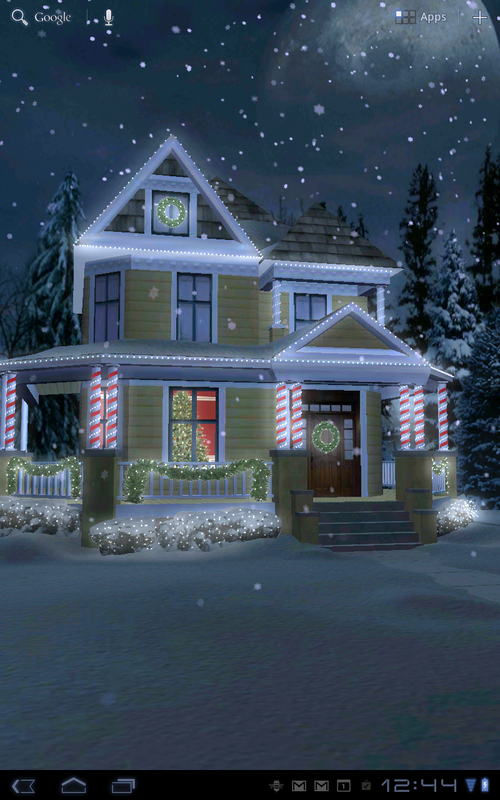 What we have here is a beautiful nighttime scene of a brightly decorated house and yard, with gently falling snow. It's a fully 3D scene, so the camera swings around as you change home screens, and we have prefs in place for you to tweak snow behavior too! 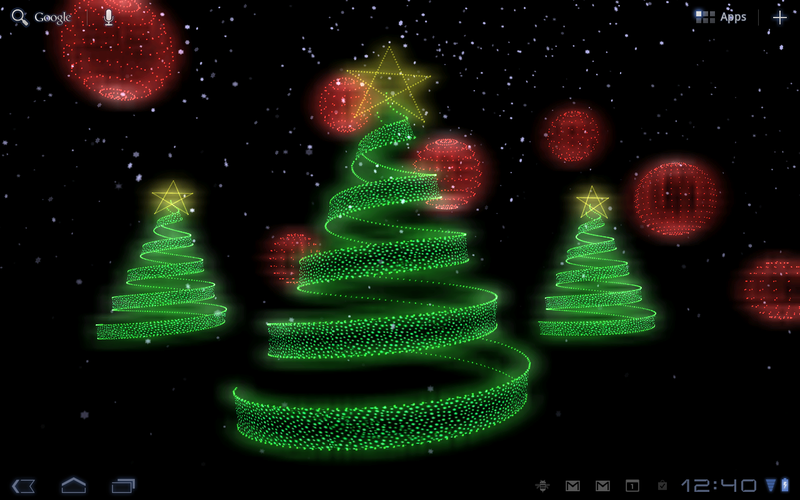 There's also a second theme available, an abstract christmas light show that's very brightly colored and looks very cool! - New Feature: Occasional shooting stars! This is a misc grab-bag of updates that initially got going because a lot of people were having trouble with the Super Fast Day checkbox. That one took a while to track down. Basically, we have an internal library that attempts to calculate an accurate sunrise/sunset time by looking at your current position, your time zone, and a few things like that. It mostly works pretty well. Calculating the position is expensive-ish though, so I skip that if you're using Fast Day, since it doesn't matter anyway. However, the renderer still uses the time of day object to get its times. That's fine, but what would happen is if you turned on Fast Day without ever having turned on regular old boring time of day first... it wouldn't ever have calculated a position. This means everything defaulted to 0, which means all the times end up being midnight, which means you don't see any times change, ever. I updated the time of day library to have some reasonable defaults, so this shouldn't happen again in the future. These are incremental updates to get some minor changes out there, remove the USO note from NA Flags, update the icon to match guidelines better, and a few things like that. Sorry folks, nothing exciting. We've had this one going on the back burner for a while, and it's exciting to finally get it out there! 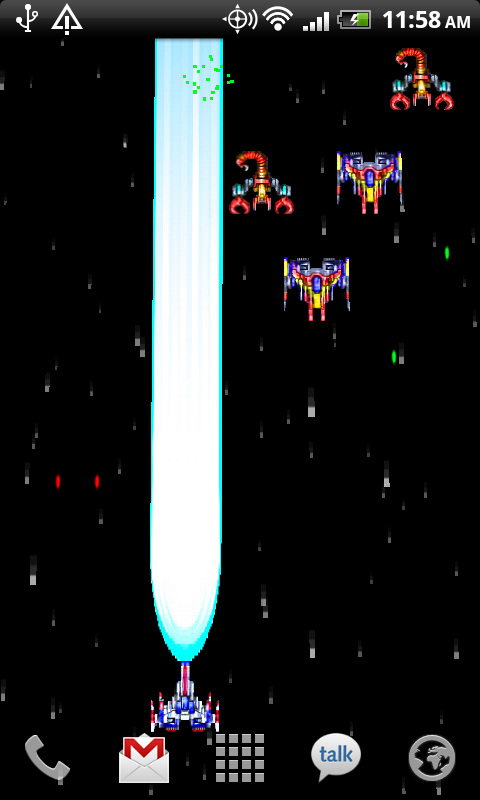 Basically, Space Battle is a retro-style arcade game that plays itself in the backgound of your home screen! 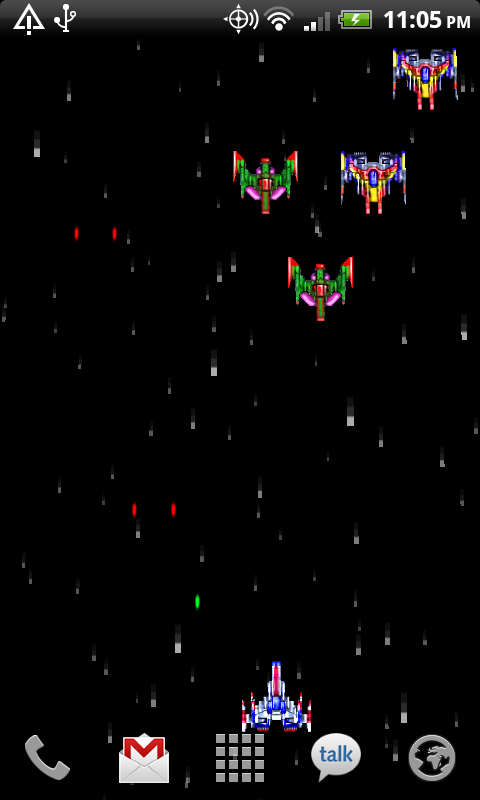 With classic Galaga style enemy behavior and the traditional hero ship at the bottom of the screen, it's a fun backdrop that runs beautifully at a solid 60fps at all times. There's some fun interaction too -- tapping on enemies kills them, tapping elsewhere on the screen causes the hero ship to fire a shot. In addition, we've got a few different sets of themed sprites, so in the full version you can pick what style of art you want. 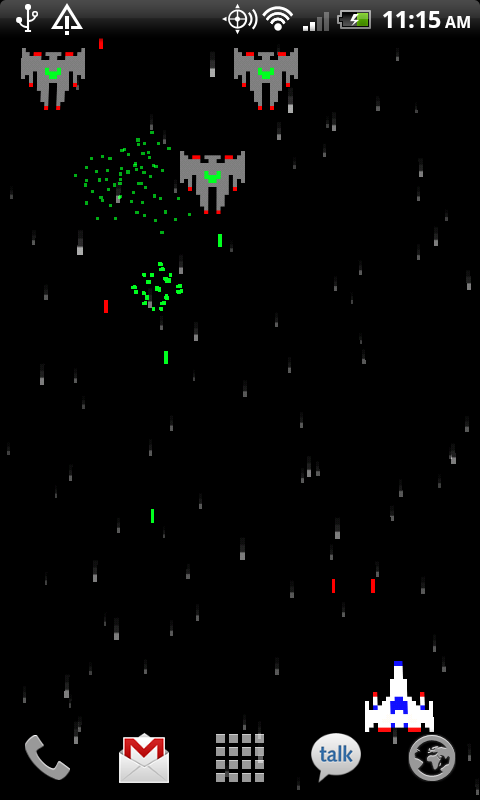 Other options include setting colors of shots, enemy formations, and other game options. I think this is a really neat concept, so hopefully other folks agree. If you have any suggestions, say the word!